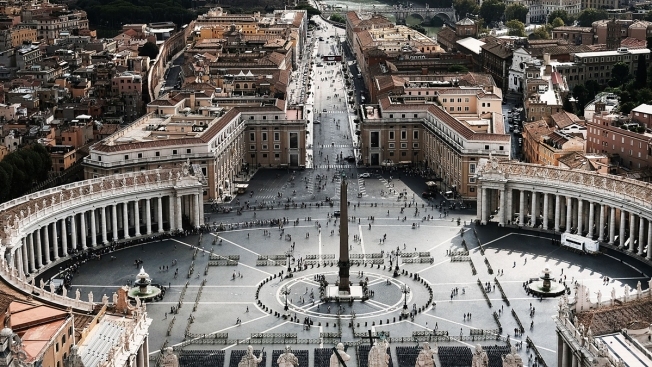 Catholic Church teaching holds that gays should be loved and respected but that homosexual acts are "intrinsically disordered"
This Aug. 31, 2018, file photo shows St. Peter's Square in Vatican City. But some bishops have balked at the notion, including Philadelphia Archbishop Charles Chaput, who insisted in his speech that "there is no such thing as an 'LGBTQ Catholic' or a 'transgender Catholic' or a 'heterosexual Catholic,' as if our sexual appetites defined who we are." "The youth are talking about it freely and in the language they use, and they are encouraging us 'Call us, address us this because this is who we are,'" Papua New Guinea Cardinal John Ribat told a press conference Saturday. Catholic church teaching holds that gays should be loved and respected but that homosexual acts are "intrinsically disordered."